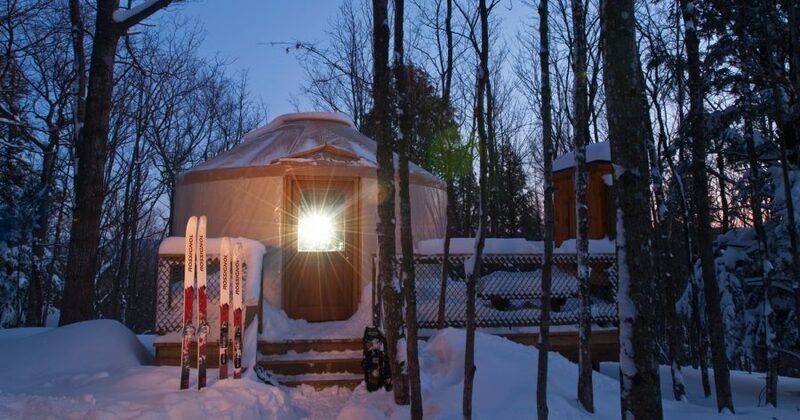 A dream winter weekend in the peaks of Michigan’s Porcupine Mountains begins in the warm yet quirky embrace of a canvas yurt. The map churned out of the printer, light gray with plain black text. It was straightforward, even ordinary, but to me, it might as well have been an illustrated manuscript. 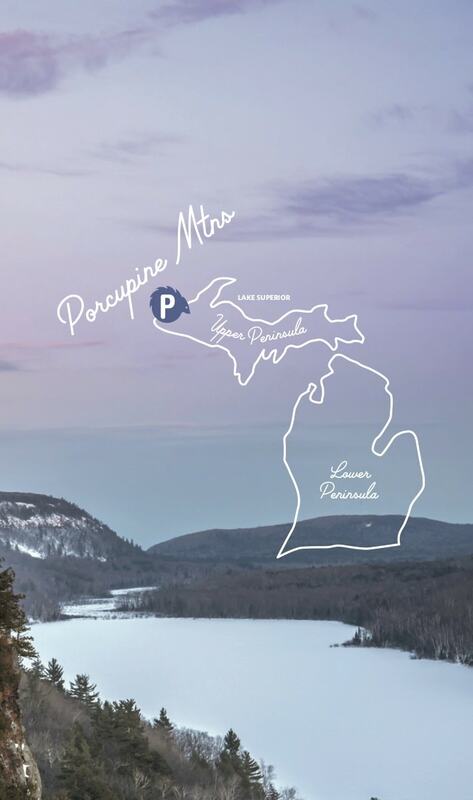 The caption at the very top alone made me lean forward in expectation: Porcupine Wilderness State Park. The largest state park in Michigan. Largest tract of old-growth northern hardwoods west of the Adirondacks. Home to the third highest peak in the state, and to the Presque Isle River, whose gorges and rapids a friend had once described to me in such dramatic terms I’d yearned to see it ever since. The park was full of trails. Wildlife. Entire rivers, parts of rivers, and the waterfalls that went with them in these small mountains, named by the Ojibwe because the hills silhouettes’ look like slouching porcupines. There were lakes, escarpments, and vistas, the last denoted on the map by a small open circle with two arrows pointing outward, as if to remind sightseers to always look in at least two directions. This story is featured in the January 2019 issue of Traverse Magazine. Get your copy. 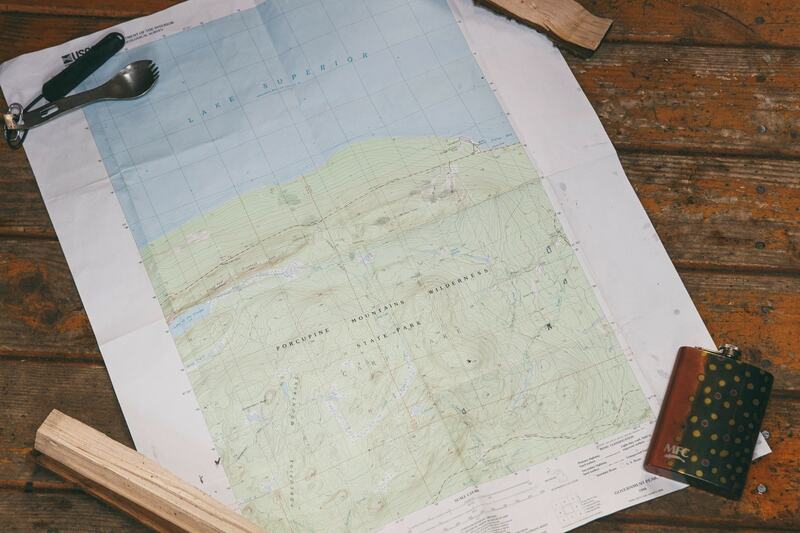 I tucked my map into a paper folder and pulled it out in spare moments. I pored over it at the diner counter in good morning light. In the Ford on the slow trip home, over rough road while Rick drove. In my loft at home while outside ravens called from the pines. I’d gaze at the Chiclet-shaped Lake of the Clouds, where I’d sat with my forestry camp friends on an August afternoon 30 years before, our arms outstretched to mirror the eagle that had floated past us, our hair and shirts plastered backward by the wind. Rest a fingertip on Miscowabic Peak to the west, then Lafayette, Green Mountain, and Summit. Inspect the waterfalls: Shining Cloud. Traders. Trappers. Overlooked. Trace the trails—Big Carp River. Correction Line. Escarpment. Consider the cabins and campgrounds: Crosscut. Greenstone Falls. Lost Creek. White Pine Extension Outpost. That was where I wanted to be, where I’ve always wanted to be. But really most of the ideas sparked by the map were unrealistic. I was going to the Porkies with my stepdaughter, Rachael, sometime midwinter. The park would be snowed in and mostly inaccessible, especially in the few days we had to spend. Despite my avid consideration of cabins and campgrounds, I already knew we were going to stay in one of the park’s yurts, which were clustered near the east end. There was no disappointment in that, though. A yurt! Another word to inspire daydreams. I squinted at their icons, a peak-roofed rectangle with a chimney poking up on the left. Two were located within half a mile of a parking lot. One sat three miles out. Another was at five and a fourth was at just over six, though it lay in such rugged territory that the computer advised it could take more than six hours even for an experienced skier or snowshoer to reach. Expert wayfinding and winter survival skills were required. 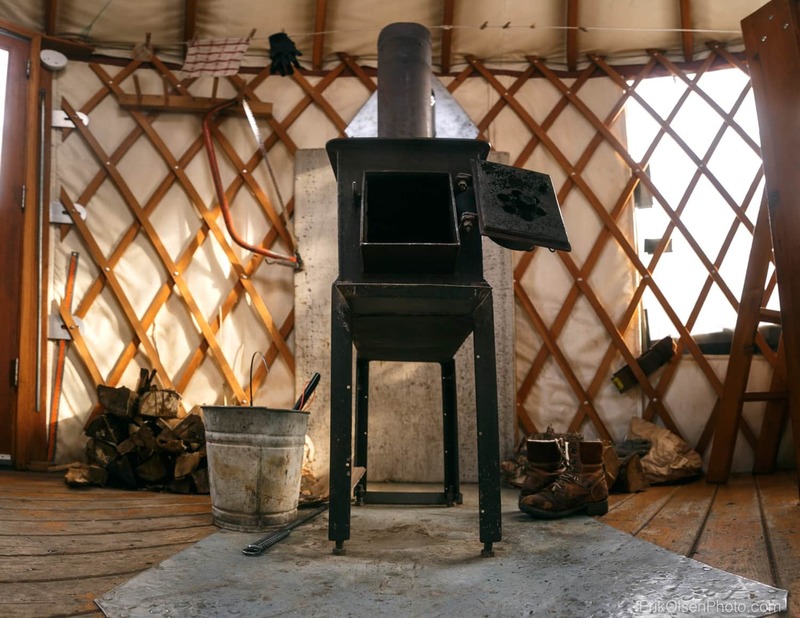 You should be ready to spend the night outdoors if you couldn’t reach or find the yurt, or if it turned out to be unusable upon arrival. Despite my leap of interest, I knew we couldn’t do that. Three miles was doable, though. Maybe five. I was a walker, and strong. Rachael was all that times three. “That close?” I said, crestfallen. We arrived just before noon on a February day. Soon we were on skis. The day was crisp; the apple trees in the Union Bay Campground spread crooked fingers against a blue sky. My backpack bulged with supplies: compass, binoculars, Swiss army knife, knitting, journal, novel. Rachael slid ahead wearing her pack and dragging an ice fishing sledge loaded with essentials: a lantern, a tote full of food, water. I straggled behind with our snowshoes bungeed to a round metal sled I’d brought from home. Within minutes I was sweating. By the time we reached the yurt, I was thrilled we’d stayed close to the car. Make reservations by calling 800-44-PARKS or online. Find maps and additional information at mi.gov/porkies. By 1 p.m. we were unpacked, by 2 p.m. ambling along a stretch of the gentle Superior Loop Trail, by five back in the yurt and famished. Soon we were sizzling buffalo burgers in a skillet on Rachael’s Jetboil. We each ate two and by 7 p.m. were playing Rummy by lantern light. Rachael repeated the rudiments of the game to me over and over, gently; I remained eager to play despite a final score of 485 to 160. But we agreed it was time for bed and loaded the stove one last time. By 2 a.m. the yurt was stunningly hot. I sweated inside my bag, then unzipped it, then kicked free of it entirely. I lay on the plastic-covered mattress, sticky and parched, and finally swung my feet to the plank floor, which was thankfully cool. I jammed my feet into my boots, went outside as quietly as I could and stood on the snow-covered stoop. The moon was full and bright, with clouds scudding across it. Maple saplings clicked and rattled. Far off, coyotes yipped. To the north a hundred yards, Superior lay rimmed with icebergs. To the south, tens of thousands of acres of forest stretched. I hugged myself, wide-awake and relaxed. By morning, it was cold. I burrowed into my bag and eyed the little stove with fond skepticism. I didn’t want to wake Rachael, and yet soon was squeaking its door open, poking twigs in, blowing on the embers. Eventually flames began to crackle, and soon Rachael was saying a sleepy good morning and getting up and at the vital business of lighting the Jetboil. Coffee. Coffee was the thing. Coffee and the frittata I’d made at home before I left, followed by the blackberry muffins she’d made at hers. After the dishes were washed in snow melted on the stove, we set off on the Superior Loop again, combining it with the Deer Yard Trail this time. The snow was so well packed we didn’t need skis or snowshoes or even our Yaktrax, though we did wear them. 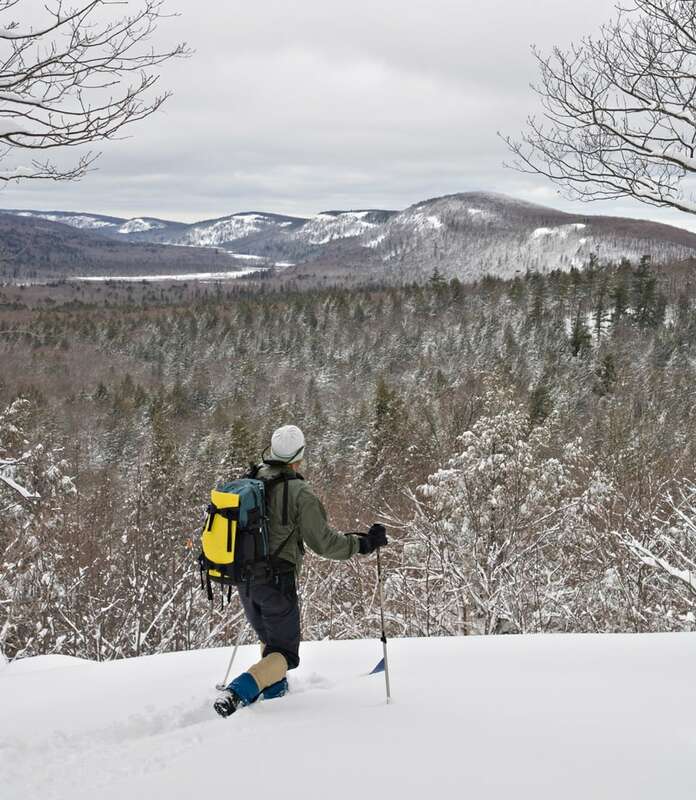 A group of walkers tromped past with waves and smiles; a few couples swished by on skis. We stooped to photograph the blue and red kerosene lanterns that hung along the way. Inspected root balls, pointed out deer tracks, crept up the path to tiny White Birch Cabin and peeked in. Later Rachael went skiing while I drew a picture in the cabin’s journal, then I snowshoed on the icebergs while she rearranged the yurt’s furniture. Later yet we napped, and knitted, and snacked on trail mix. I sank happily into Andy Catlett: Early Travels; Rachael read a fermented food cookbook. Bedtime came early again and in the morning it was a happy replay of coffee and frittata and muffins. Time moved easily, and also flew. Soon it was Saturday noon and we were packing and trekking through the Union Bay campground with its apple trees and chickadees. I stopped and turned. Smoke trailed from our chimney; sun lit the beige canvas. Our yurt. In Mongolian it just means home. That was apt. Our wilderness weekend had been almost entirely defined by coziness. Not only was it not radically different from the way we both live—in the woods, with woodstoves and knitting and good food and coffee—but also we hadn’t pushed into the interior at all. Despite my daydreaming, I’d never left the Deer Yard Trail. And still I felt as if my soul had grown a couple of sizes. 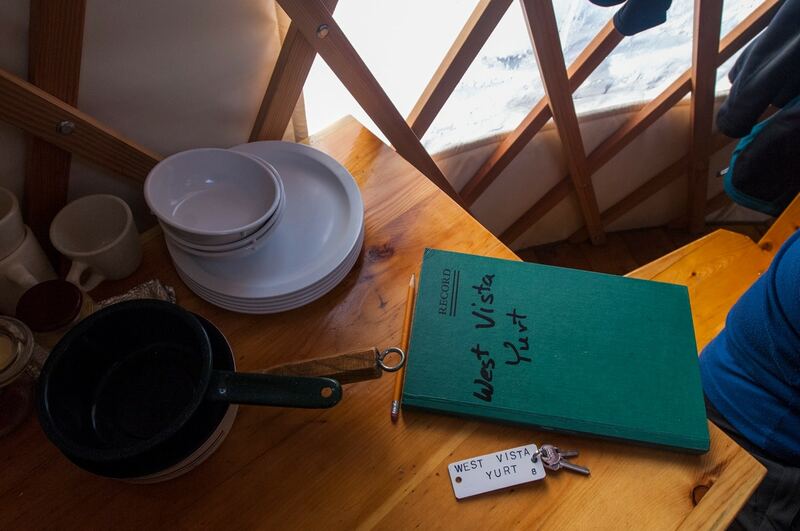 Life had been funneled down to one round canvas room with two bunk beds and a woodstove in it, to snowy views and coyotes howling at the moon, to coffee and cards and snowmelt for wash water. And it had been good. Better than good. It had been close to euphoric. Maybe we could have had this experience in any quiet spot a few steps off the grid. But we didn’t. 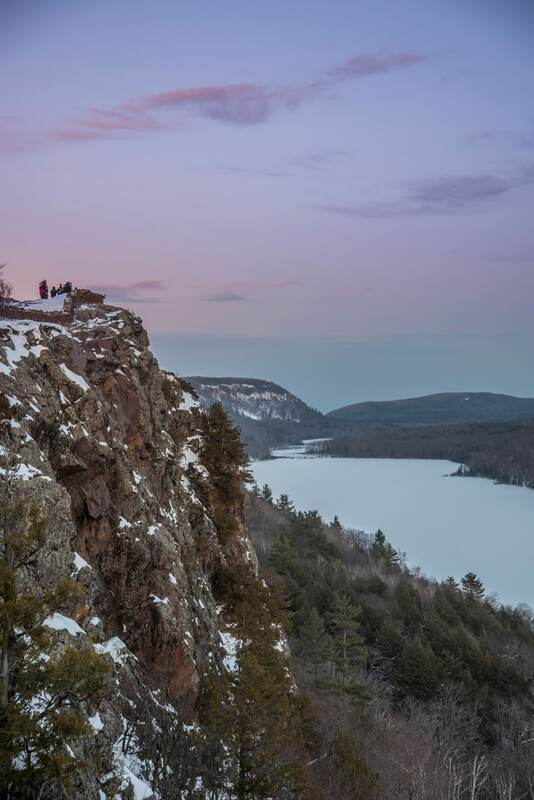 We had it tucked along the edge of the vast Porcupine Mountains. And I suspect that vastness is important. That the ineffable and infinite exerts its influence even unseen and un-trekked. Besides, big change isn’t always needed. Often just a little is enough to wake you up. Travel Tip: On the way, stop at Settler’s Co-Op grocery in Bruce Crossing for coffee and a candy bar. Returning, get lunch at JW’s BBQ and Brew in Bergland. Ellen Airgood writes from Grand Marais, where she owns West Bay Diner & Delicatessen with her husband. She is the author of “South of Superior,” “The Education of Ivy Blake” and “Prairie Evers.” // Aaron Peterson is a photographer and filmmaker based on Michigan’s Upper Peninsula. // Erik Olsen shoots outdoors and active lifestyle photography.